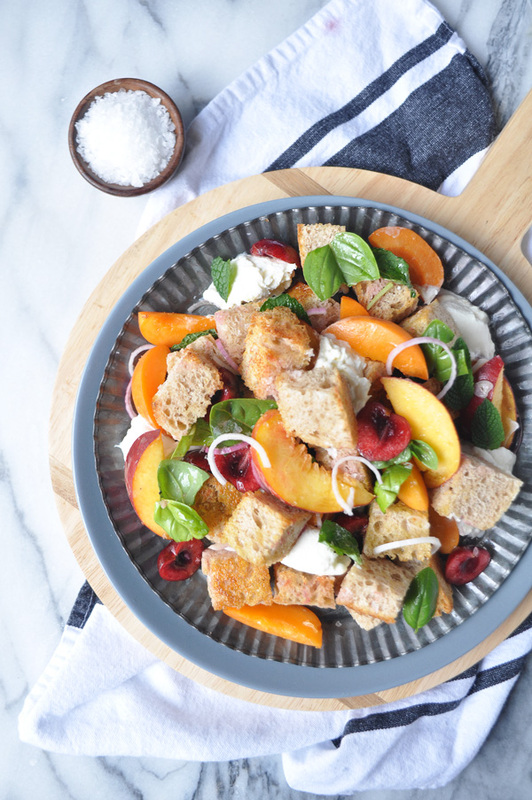 A panzanella salad is just a fancy word for bread salad. It is a great use of older bread and is delicious when paired with fresh fruits or vegetables, mint and of course some creamy cheese. I like to use fresh summertime fruit in this salad because it is an unexpected pairing. The sweetness from the fruit pairs well with the fresh herbs, the savory shaved red onion, the creamy burrata cheese and the tangy red wine vinegar in the salad dressing. When combined, the bread gets a little soggy and crunchy all at the same time. Heavenly. I use apricots, cherries and peaches in this salad but feel free to use whatever fresh in-season fruit you can find.